Gospelr is quick to point out that it’s not “just another Twitter.” Instead, the site prides itself on being the world’s first “Ministry Microblogging” tool for those that want to share thoughts, ideas, words of encouragement, prayer requests, daily scripture readings, and oh so much more. Gospelr tries to change the way people interact on the service too. A normal “tweet” is colored in brown, while replies are green, and imported tweets from services like Twitter are colored in blue. That coloring scheme will make it easier to identify what’s being said and who is saying it. The service can also let users upload and share files like Pownce, and most importantly, it auto-refreshes the page so you don’t have to. 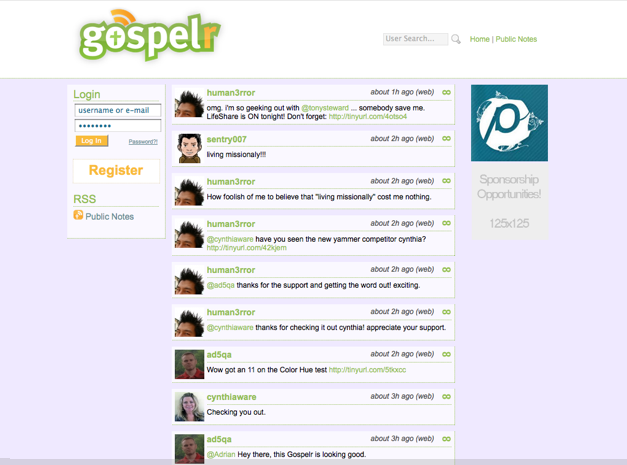 Gospelr is available now for those that are looking to try it out. I’m sure you’re wondering what is my favorite feature of Gospelr. Is it the chance to tell the world what I read in the Bible today? Nah. Is it the ability to hear others tell me about JC? Nope. It’s the RSS button. Check it out. Awesome, huh?